Working on a new hardscaping project but can’t find that missing piece to the puzzle? Why not add fencing? Fencing is a great way to complement your hardscaping project and add that element that was missing to give your project a complete feel. Here are a few great ways to improve your hardscaping with a new fence. 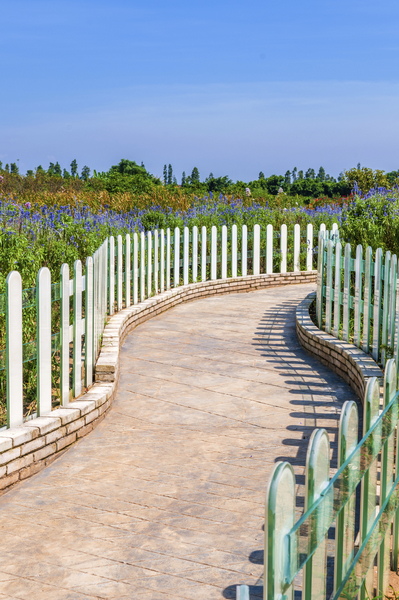 Fencing is a great way to make a walkway feel more complete. 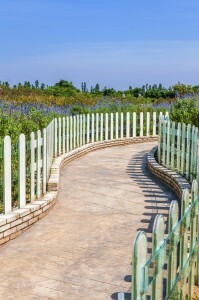 Fencing strengthens the lines of a walkway and gives it a cozy, enclosed feel that changes the dynamic of the walkway. Great for walkways that already have a natural border. From aluminum to wood to iron, any type of fencing works well for walkways. Fencing also goes great on top of walls. From below, it serves to add height to the wall, giving it an impressive appearance. From above, fencing serves as both an aesthetic addition and a safety barrier. Iron and aluminum are the ideal fences for walls, as their posts can easily be cemented in the wall securely. Looking to give your patio a more defined space? Add a fence! Patio fencing gives a patio a more defined aesthetic and makes it more of its own entity. Great for creating a semi-private space in your yard. An understated iron or aluminum fence works well for patios, adding to it while not detracting from the central piece which is the patio. Outdoor stairs are always complemented well by fencing. Not only does fencing look great on outdoor stairs, it also helps aid balance. Iron and aluminum fencing is great for outdoor stairs for its stability and durability. Hercules Fence has been providing professional fence installation and service in Richmond for more than 50 years. This entry was posted on Friday, September 12th, 2014 at 4:08 pm. Both comments and pings are currently closed.